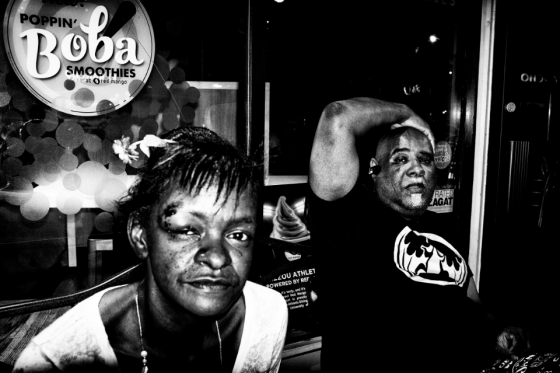 Acclaimed street photographer Jon Luvelli is establishing a collection of his works within the State Historical Society of Missouri’s permanent art collection. Luvelli’s fine art photography has garnered worldwide attention for its distinguished images of Midwestern townscapes. A selection of these newly acquired photographs is currently on display at the State Historical Society’s Columbia art gallery on the ground floor of Ellis Library. A native of Como, Italy, Luvelli was raised in a rural farm town near Columbia, Missouri. According to Joan Stack, SHSMO’s curator of art collections, his work casts an aesthetic spotlight on contemporary life in the rural routes and small-town streets of the Show-Me State. In an August 7, 2016, review of Luvelli’s Unseen Columbia exhibition at the Boone County Historical Society, Aarik Danielsen, Columbia Daily Tribune arts and entertainment editor, wrote that Luvelli captures Columbia’s collective history through his focus on the unnoticed. Stack said Luvelli’s work also conveys social messages, never shying away from the complicated subjects of racism, poverty, sexuality, abuse, and addiction. Luvelli’s work augments the State Historical Society of Missouri’s diverse art collection, which includes photographs of the American West by Edward Curtis, Thomas Hart Benton’s Year of Peril World War II series, numerous paintings by George Caleb Bingham, and many other pieces illustrating Missouri’s regional and westward expansion history.